Vickie Saez of Gargoyle Kennels in Miami, Florida, will never forget her first year out on the show circuit with her black-mask Dogue de Bordeaux. “I walked in the ring with Caesar for the Open Dog class, and the ring steward came over to ‘oh so gently’ tell me I was in the wrong ring,” she recalls. “I had to tell her that Caesar was a Dogue de Bordeaux, and we were most certainly in the right ring.” No matter what Dogue de Bordeaux standard you consult, no distinction is made between red and black masks: Both are equally correct for the breed. But though the standard is color blind, Dogues with a masque noir still have an uphill battle. In Europe, despite long-term efforts by breed clubs to educate judges and breeders alike, Saez says there is still a “quiet stigma” to the black mask that can be traced to the opinions of early breed enthusiasts. It’s a vicious circle: Because most judges do not see many black-mask Dogues, when they do turn up judges are less comfortable with them and so less likely to reward them, which in turn makes breeders and exhibitors more reluctant to show them, which only cements the black mask’s minority status. And ’round and ’round we go. Some breeders stress that it isn’t so much that they dislike the black masks, but rather that they gravitate more strongly toward the reds. Indeed, there’s always that inevitable concern about mistaken identity. “Many Dogue breeders I’ve spoken to associate black masks with the Bullmastiff, saying that if they had wanted that look, they would have gone into Bullies,” Saez says, despite the fact that the breeds are so different in their head type. While correct expression is important in any breed, it is vital in the Dogue de Bordeaux. 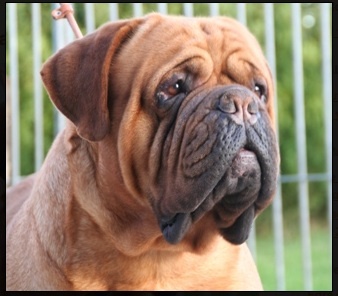 French breeder René Brochier notes that, while it may be difficult for the novice to see beyond it, mask color is not what gives the Dogue its required “sour mug” look. “It is the volume of its head, its trapezoidal shape with its high and broad forehead, its mobile wrinkles, its deep muzzle with a well-defined stop, its oval eyes set wide apart” – qualities that may be missing on a red mask as well. Raymond D. Smith of Heritage Bordeaux in Cincinnati, Ohio, notes that often the color of the coat rather than the mask is more of an obstacle to imparting the “frank” expression that the standard calls for. “It tends to be harder to see a good expression in a dark Dogue in general,” he says. Black-nose Dogue Bull di Alfaree. In an effort to give the black-mask more recognition, some show organizers overseas have special classes for them. But Swainston sees that as a mixed blessing. Brochier points out that several other myths have sprung up around the black mask. In the end, preferences aside, breeders agree on this: A typey Dogue is a typey Dogue, no matter what color the mask. If it is more difficult to breed a typey black mask than a red one, that has nothing to do with the mask color, but rather with the limitations of the gene pool. In the end, she says, the same kind of color blindness that we encourage and foster in our human society should be applied to the breed as well. “Black Mask: The mask is often only slightly spread out and should not invade the cranial region. There may be slight black shading on the skull, ears, neck and back. Pigmentation of the nose will be black. Brown Mask: Pigmentation of the nose and eye rims will also be brown. No Mask: The coat is fawn: the skin appears red (also formerly called ‘red mask’). The nose is then reddish or pink. When Dogue de Bordeaux fanciers use the terms “red mask” and “black mask,” what they are really referring to is the pigment of the dog, which is reflected in the nose color. Red-nosed Dogues have red masks (or no mask at all), and black-nosed dogs have black masks, but the gene for masking is inherited separately from pigmentation. Pigmentation in dogs is a simple autosomal recessive: The black is dominant, and red is recessive. What this means is that in order for a Dogue to have red pigment – and by extension a red mask, if it is present – it must carry two copies of the recessive gene for red pigment, or nose color; this genotype would be written as “rr.” When two red-nosed Dogues are bred together, they can only produce red puppies. In order to produce black-nosed puppies, one of the parents must be black nosed. A black-nosed Dogue can be homozygous for the gene – written “RR” – which means that he carries two copies of the dominant black gene, and so can only produce black-nosed Dogues. But most Dogues de Bordeaux are heterozygous for this trait – “Rr” – meaning that they carry one dominant gene for the black nose, as well as one recessive gene for red. Phenotypically, this dog will have a black nose, but can produced red when bred to a red-nosed Dogue or another black who also carries the recessive gene for red. When a heterozygous black-nosed Dogue is bred to a red, each puppy produced has an equal chance of being black nosed or red. The black-mask Dogue de Bordeaux has been neglected in recent decades, and as a result very few exceptional examples stand out from the crowd. Fortunately, the trend is being reversed because fewer and fewer breeders adhere to the myth that the black mask is not a pure Dogue. This theory was published in 1896 by Pierre Megnin, former army vet and editor of the newspaper L’Eleveur, in a precursor to the first Dogue standard. Megnin denounced the black mask as a bastardization of the breed by the infusion of Mastiff blood, although it must be remembered that crossbreeds have always existed. In 1910, Joseph Kunstler, professor of comparative anatomy and embryology at the Bordeaux Faculty of Sciences, curator of the Bordeaux Museum of Natural History and regarded as the “father of the modern Dogue,” restored the truth. In his Critical Study of the Dogue de Bordeaux at French Shows, he was the first to point out the lack of intensity of the black mask (and nose) of the Dogue, through which a reddish base is frequently visible compared to the nose and the mask of the Mastiff and Bullmastiff. Also worth noting is that the black mask in the Dogue is never very extensive. Although the eye sockets can be darkened, the black should not form “spectacles,” common to the Mastiff and Bullmastiff, nor spread to the head region. Xohor de Fenelon (V’Pach x Sara), whelped 1949. N’ Hems du Domaine des Sources (Lutteur de Gorge d’Or x Urelia), whelped 1977. Emilion Du Terroir Bordelais (Croux De La Seigneurie Des Chartrons x Criska Des Coteaux De L’Autan), whelped 1989. A more recent Dogue, Cetje van’t Bulscampvelt (Ch. Brando Dospilos x Zoraya Garde D’Honneur Du Monde). An equally impressive Cetje daughter, Brandoux Black Velvet Blackx.